The Respa Eternal Support 3' Divan Bed offers firm support with its RespaTech Ortho Spring System and an extra strong frame for added durability. Hghly recommended for spinal alignment and posture care, the regular turn mattress provides edge to edge support and is traditionally quilted for added comfort. This bed comes with a choice of divan base, storage and leg options. The Respa Eternal Support 3' Divan Bed is part of Respa's Lifestyle Collection of Beds and Mattresses. Offering Firm Support, this bed incorporates Respa's RespaTech Ortho 12.5 Gauge Spring System and comes highly recommmended for Spinal Alignment and Posture Care. Traditionally Quilted with Cushioning Layers, the Regular Turn Mattress features an Edge to Edge Support Frame which helps to reduce partner disturbance and Reinforced Side Supports that enhance the frame durability and quality. The Respa Eternal Support Single Bed comes with a Choice of Upholstered Divan Base from Respa's Exclusive, Luxury and Value Range. It also benefits from a Choice of Two Drawer or Four Dawer Storage Options and Leg Options: Standard Chrome, T Chrome, Square Walnut and Square Beech. 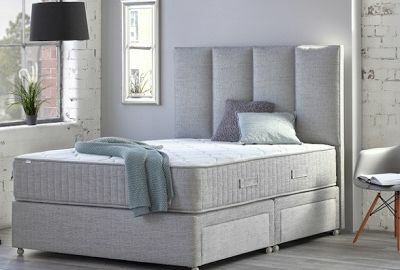 Complete with Respa's 5 Year Warranty, this luxury bed has the reassurance of Free Delivery* and Free Collection and Recycling of Your Old Bed throughout Northern Ireland, and Counties Monaghan, Louth and Dublin, in the Republic of Ireland.